What Are Mason Jar Salads? 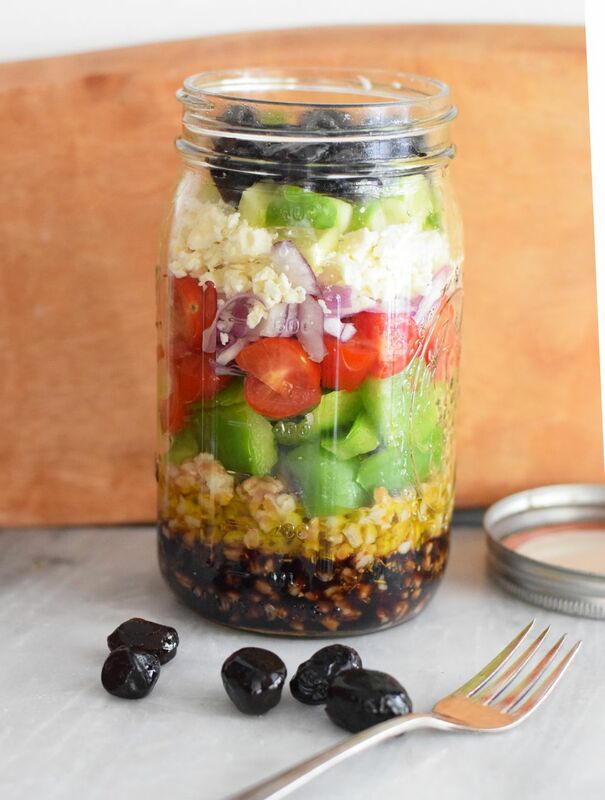 Mason jar salads are the perfect make at home lunch. They're not only a great way to use up leftovers, but also so easy to prep ahead of time. In order to make a mason jar salad that'll hold until lunchtime, you'll need a go-to layering technique. If you're looking to make a large, hearty salad, use a quart-sized mason jar for the following recipes. Dressing First: Adding the moist layers on the bottom will keep the wet ingredients from getting your greens soggy. Chunky Ingredients: Next, pop in things like grains and meats. Ingredients that soak up the dressing are ideal for this layer. They'll also help keep the dressing at the bottom since they're denser. Sweet and Savory Fixings: All of those delightful toppings that make salads more than just a salad go in next. That means cheeses, nuts, dried fruit, scallions, and bacon bits. The meat and grain layer will prevent these ingredients from getting wet and, since these are usually dry, they won't get the lettuce soggy either. Greens Last: Any kind of lettuce or greens go in last. Putting them at the top will keep them fresh and crisp. When you're ready to eat, flip the salad into a bowl. Since you stacked the lettuce last, it'll fall to the bottom and all the other ingredients will land on top, just as it would normally be when you serve a salad! Did you know that an authentic Greek salad actually has no lettuce at all? It's filled with just the good stuff—tomatoes, onions, Kalamata olives, and feta cheese. This version also includes cooked farro to add some filling whole grains. Here, the layering isn't as important since no greens are included and all of the ingredients will taste great when they're infused with the dressing. You can fill your jar 3/4 of the way and shake the salad when you're ready to eat. This is a wonderful option when you're on the run and don't have access to a separate bowl. You can also use whatever balsamic and olive oil dressing you want, whether it's store bought or homemade! Think of this as a healthy spin on your favorite Buffalo chicken wings. It's easy to reproduce with store-bought or homemade ingredients. Fill the rest of the jar with chopped romaine lettuce and sliced scallions for an extra bite. Who would have thought you could turn leftover pulled pork into a weekday salad? It'll satisfy your need for a hint of sweet, along with your cravings for tangy and salty. We also recommend adding bacon and you can easily substitute the barbecue pork with shredded chicken or even barbecue shrimp. Top off with chopped romaine lettuce. Everyone loves a filling burrito bowl from Chipotle, but our wallets don't love paying for one everyday. Make this simple vegetarian burrito bowl at home for a fraction of the cost and even more nutrition. Combine all of the ingredients in a bowl with a whisk and use as much as you like in the bottom of the jar. You can keep the rest in the refrigerator. Top off the jar with chopped fresh romaine and enjoy your homemade burrito bowl on the go! This Thai noodles is like takeout, but better! It's a great way to use leftover pasta and the nutty dressing comes together so quickly. The following recipe makes a lot of dressing. You can save it as it refrigerates well and works on top of chicken and rice. Combine all of the dressing ingredients in a blender and blitz until smooth. Then layer the dressing on the bottom of your jar. Other optional ingredients also include Asian pickled vegetables, shredded carrots, and shrimp. Everyone loves a Caprese salad filled with mozzarella, tomatoes, and basil and this is a portable way to bring enjoy the deliciousness at work. This combo includes some pasta to make it extra satisfying. You can also add some grilled chicken to bump up the protein. Start with a simple mixture of olive oil and balsamic vinegar. A balsamic reduction tastes extra delicious and adds a little sweetness. 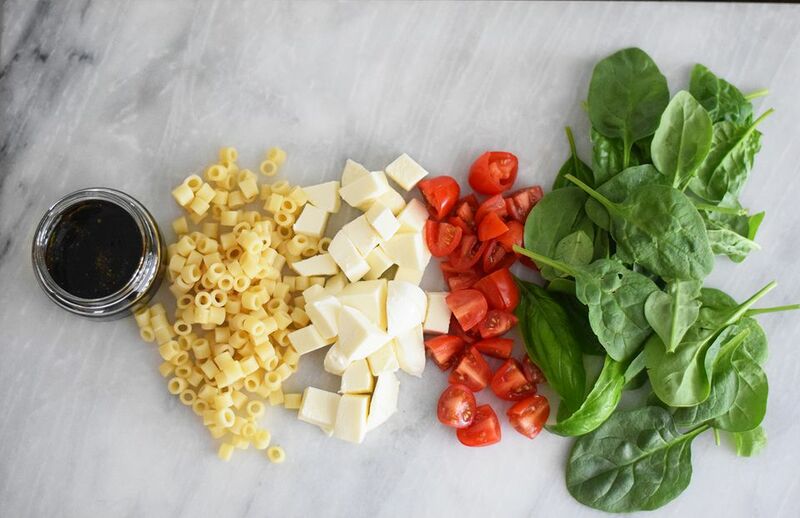 1/2 cup cooked pasta, the shape of your choice! Layer on some sliced cherry tomatoes, garnish with a few basil leaves, and fill the rest of the jar with fresh baby spinach. Take your gourmet salad anywhere you go!